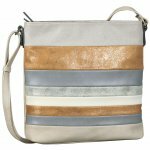 Gabor Blanca 8100 women's cross body bag. It features a high quality synthetic leather upper with contrast paneling and an embossed Gabor logo. The zip-top fastening adds extra security for your belongings, while the internal and external zipped pocket allows you to organise your things efficiently. It has a fully adjustable shoulder strap so you can achieve the perfect length for you. Matching purses are available, see Gabor Blanca 8103 and 8104. 25.5 x 25 x 5cm (approx).